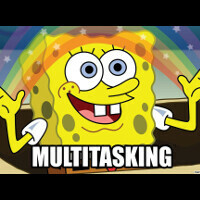 Ah, multitasking on a smartphone. Ever since split-screen capabilities have graced handsets, the controversial topic on whether this is actually useful has been on techies minds and in their debates. On one hand – we have the opinion that yes, sure, it's great to have yet another feature that would generally allow us to be more productive with our handset; on the other – a man could argue that there's only so much “productive” work you can do on a 5.5" screen, and splitting it in two just hampers the process. You can check out some ideas about using the Note 4 and Note Edge's features for a more seamless user experience below. Given what we've seen from the Note 3 Lollipop videos – it seems that the older Galaxy phablet will also be getting the shiny new UI, so if you own that one – take note of the functionality that's headed your way. Sure, we've seen floating windows before, but activating them was usually cumbersome, and we were limited in the choice of apps, which supported the feature. Not to mention that one couldn't translate from a full-screen experience to a pop-up view of an app – if you wanted to, say, move your Internet browser to floating mode, you'd actually have to close it and open it specifically in the multitasking view (and you'd have to use the S Pen to gain access to the Pop-up View function). Well, Samsung's new TouchWiz features make the process much more straightforward and usable – you can now move most apps into floating mode by just dragging your finger from an upper corner of the display towards the center. If you wish to maximize the app back to full-screen, just grab it and flick it towards the top edge of the device – voilà. See the slideshow below for a detailed description of the process. First things first – head to your phone's Settings and find the Multi Window menu. After making sure that Multi Window is set to ON, tick the box next to “Pop-up View shortcut”. You're ready to undock windows at will! Here's an example – we have Google Chrome opened on this screenshot. We touch the top-left point of the screen and move our finger diagonally, towards the center. You can choose the exact size of the floating screen you wish to end up with, indicated with a frame, as seen in the screenshot. Dragging further down makes it smaller. There we go – we are now looking at PhoneArena's channel on YouTube and its website in the Chrome browser – Arenaception! OK, I've got the floating window thing down, but – now what? Well, there's a few ways we can go from here. For one – we can just keep eyes on both on-screen apps to cover whatever multitasking need we may have at the moment. Alternatively, we can copy and paste content directly from one window in the other. Should we decide that we wish to minimize the floating app for a few moments, but not close it, we can do that, too – just like it was possible on the Note 3 – it ends up being a much smaller, and manageable, floating icon. And, once we're done with the multitasking, we can flick it back up to the top of the display and return it to full-screen. Check out the slideshow below for a detailed explanation. Tapping on the white circle that's in the top-center of the floating screen will present you with the mini-menu you see in this screenshot. Its leftmost option is the one you need to enable here. From there on, it's just a matter of dragging whatever you wish to your windiw. Dragging and dropping content from one window to another works both ways, as long as both open apps have a text and/or image input field, of course. Now, let's take a look at some minimizing and maximizing action. From the menu that pops up when you tap the window's top-center circle, select the second option. You now have a floating icon of the minimized app, which you can position anywhere. Tapping it will open the app in pop-up view mode again, not in full-screen. To return a floating app to full-screen mode, just grab it and slide it up, towards the notification area (it does not matter if it's in minimized, or pop-up window view for this to work). And you're back to the starting point. Of course, the good old split-screen is back, but it has also received some new refinements – mainly in terms of getting easier access to it. For example – we can now easily dock a floating window down to share the screen with whatever app was open behind it. Alternatively, we can open the Recent Apps menu and open any of the apps we see there directly in a split-screen window by pressing a brand new, shiny button. Or, we could have our TouchWiz set so that whenever we click an external link from an email, for example, the app that's supposed to show its content would automatically open in split-screen, allowing us to keep an eye on said email. The Multi View app drawer has also been redesigned. Instead of constantly hanging out on the left of our screen, annoying us with its little pull-out arrow, the whole drawer is now completely hidden, and can be called out by just holding the capacitive back button (holding it again closes the drawer). You can initiate Multi View from there, by dragging your apps of choice to the top and bottom halves of the screen, or you can just tap on an app and have it open in floating mode – up to 5 apps can float on your screen. Check the slideshows below to see how that works exactly. Let's get back to our floating Chrome app over the YouTube video in the background. Say we want to have these two apps in split-screen right now. Setting up apps to automatically open in split-screen, when there is already one open in full-screen, is an easy task. First, we need to make sure that the pictured option is set to ON. … two apps, automatically opened in Multi Window mode – the email app, and the browser, which now shows us what the link was about. Pressing the capacitive Recent Apps button opens the menu you see here. Notice the split-screen buttons present on the upper-right part of the frames of apps that support the feature. Touching said button will give you this – your chosen app will appear in the top half of the screen and a list of other recently used apps will appear below it. Scrolling to the right will give you a choice of pre-chosen apps, which is user-customizable. So, let us pick YouTube here. The S Pen has been constantly growing since the original Note hit the market – there's no doubt about that. Sammy's proprietary stylus was definitely an impressive achievement back with the Note 3, but the refinements in this year's model make it hard for us to look back at the older models. The main thing we like is the new Meta Text function, which, combined with the Action Memo and its inherent float-over functionality, allows us to scribble notes on the fly, and transform them into print-letter form for further editing and, most importantly, ensuring that other human beings will be able to read them. Check the slide show below to see what we mean. Back in our two-window Arenaception, let's say we want to make a note, or a list of something to share with other people. Press the S Pen's button for this menu and choose Action Memo. You will be given this stamp-it lookalike, which floats above everything else and does not stop the YouTube video from playing in the background. Write your message. You can now save the Memo and get back to this step later, or just do it now – open the S Pen menu and choose Smart Select. After you've selected your text, wait for the Meta Text icon to appear on the top right of the box. Press it. You now have the text in print-letter format, available to be copied in the clipboard, or shared in whichever app you like. That's why the Note 4 is the best phablet. TW haters? What about this? Productivity tool is that Note4 with TW. Love my Note, hate the TW. It's some ol bull. Samsung gets lost in the bark and misses the forest many times.All the crazy pen and multitasking stuff in the Note 4 is a good example of this. Only a few apps work well when the phone is in landscape mode, but Samsung is pushing crazy things like using two small windows instead. For quite a few people, getting a more functional app in landscape mode is more important than running multiple apps side by side, each with reduced functionality because they are running at 1/2 size. I love the quality hardware that Samsung makes. They are truly one of the best when it comes to hardware design and manufacture. But their software... from BloatWiz to PenWiz to MultiTaskWiz... is the opposite, just bad design, and sloppy implementation. So you're criticizing Samsung because this Multi windows feature doesn't let you run a Single window in landscape. Umm... what? And what's funny to me is that most Samsung apps actually can run in landscape and they are nice in landscape. S-note, Action Memo, Messages, and Samsung's version of file manager, are some that I use which are great in landscape. And I'm not even talking about their latest Note 4. All these are on my Note 3, and I'm pretty sure the Note 4 can do everything better than the Note 3. So, well, I don't get your complaint. Lot of flyweight users out there. If you have a Note 3, you will notice that while some few apps do work in landscape, the apps do not work very well in landscape. This is really an issue of having to think deeper about how people use apps. And Apple "got it". People don't buy a giant phone just because they want giant "portrait mode" apps. They want to leverage landscape mode and Samsung basically stopped working on making this great and instead worked on all the multi-tasking/pen stuff that many people think is just a gimmick.